Refiguring Art History and the Importance of Representation #ArtTuesday « Adafruit Industries – Makers, hackers, artists, designers and engineers! Born in Germany in 1816, Emanuel Leutze came to the United States as a child, later to become known as the painter behind one of the most iconic paintings of American history. His Washington Crossing the Delaware is part of a grand history of our nation’s penchant for myth-making. A classic example of the type of art known as “history painting,” when elites commissioned works to commemorate events that defined national identity, Leutze’s work centers George Washington as the father of the United States. 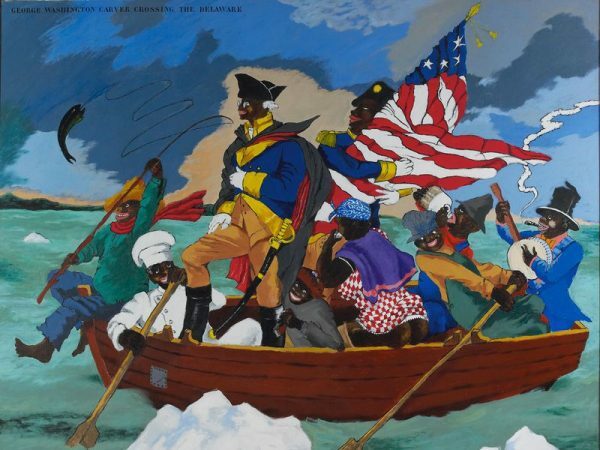 But in an exhibition in Seattle called Figuring History, the late African-American artist Robert Colescott provides a tongue-in-cheek send-up of the painting. The Oakland, California, native places George Washington Carver, the agricultural pioneer at the Tuskegee Institute in Alabama, in the spot of his namesake. Colescott surrounds the central image of Carver with Aunt Jemima figures and African-American cooks and banjo players. Sparing no one, he makes fun here of multiple stereotypes, both Leutze’s iconic image of a white American hero and pejorative depictions of African-Americans.